Every year, ZF Friedrichshafen AG, one of the largest sponsors of Global Formula Racing, invites to its’ ZF Race Camp at the exhibition center Friedrichshafen. ZF Race Camp is a two day Formula Student training camp where ZF-sponsored teams get the opportunity to prepare and get ready for the events. ZF provides ideal training and testing conditions to the teams, completed by experienced employees who support the teams with their knowledge in all areas. Global Formula Racing took this opportunity and participated with two electric cars, GFR13e and GFR14e, and the entire team. Participating with two racing cars, GFR managed to drive the most laps of all teams present and convinced with fast lap times. GFR impressively substantiate their claim for the upcoming events. In addition to the lap-king GFR13e, also GFR14e was able to complete its first official laps on the very well-prepared auto cross track after passing the technical scrutineering. The mechanical set-up promises GFR a good season. GFR is confident to set up traction control, power limitation and the new torque vectoring of GFR14e in the upcoming testing days. This is a good basis to significantly beat the lap times of GFR13e. The team took the opportunity of the scrutineering at the event to find and fix the critical points on the car in order to ensure a smooth scruitineering at Hockenheim and Spielberg. In addition to the dynamic events and the related technical scrutineering, ZF Race Camp offers the possibility to present the static events “Business Presentation” and “Cost Report” in front of judges. Both, the Business Presentation team and the Cost Report team took this opportunity for the pre-final tests. The Cost Report team presented its detailed statement of costs of the vehicle and the required real-case scenario for ZF Race Camp. The objective of the cost event is to fully determine material and manufacturing costs for the car by standardized tables and to justify them. This year, the real case scenario asked for a make-or-buy analysis of the steering gear and another arbitrary part. GFR compared purchased aluminum rims with self-manufactured carbon rims. Therefore, GFR has analyzed the cost aspects as well as the technical benefits based on student research projects and experimentations in this field. Based on the results of the Cost Report Team, the Business Presentation team presented their business proposal for the sale of the all-new electric racing car. Not only the content of the business plan, but also presentation and creativity was evaluated. With the feedback from the judges, the Business Presentation team attempts the last stage before Hockenheim and Spielberg. In the next week the team will refine the concept, add multimedia elements and draw up the deep dive topic for Hockenheim. Both presentations got a positive and valuable feedback from the judges. The team will do the necessary improvements, also the advices and criticism will have some influence in the cost report and business proposal. Global Formula Racing is very grateful to ZF Friedrichshafen, all volunteers and formula student teams who made this preparation occasion possible. The team had two eventful days and is looking forward to a successful season with all sponsors and team members. 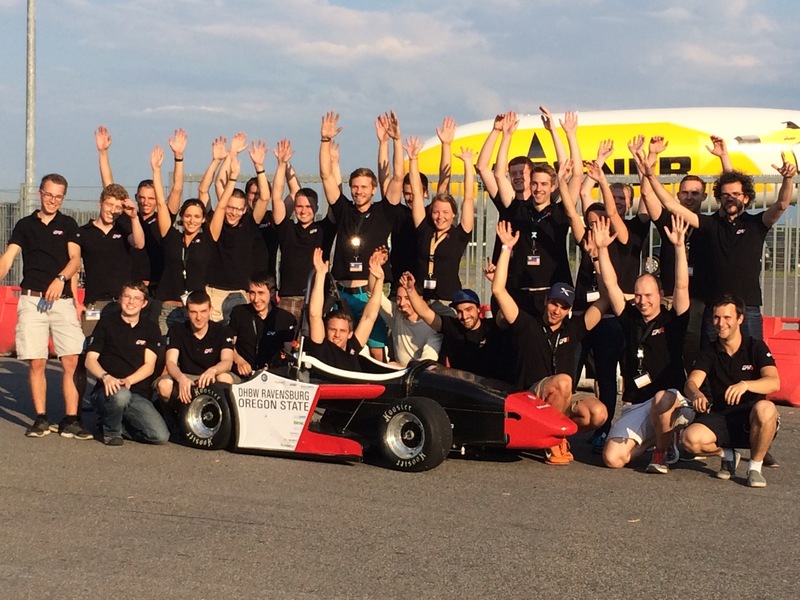 ← GFR wins Formula SAE Michigan, Formula Student Germany, Austria and Spain in 2014!